Over the years, industry partnerships have become increasingly common within the U-M research community—yielding important outcomes in fields ranging from computer engineering to health care. But, in 2008, when Assistant Dean for Graduate and Postdoctoral Studies Victor DiRita was asked to help finalize the details of a postdoctoral fellowship program proposed by Centocor Research & Development, Inc., he knew he was working on "something unique—and uniquely important to the future of medical education and research." That "something" was a public-private partnership developed and funded by Centocor Research & Development, Inc., a company dedicated to the research and development of treatments for a wide range of immune-mediated inflammatory disorders. With the support of Centocor and the direct participation of its scientists, the program is intended to build and diversify the company's pipeline of talent by supporting postdoctoral researchers from underrepresented populations. Officially established in early 2009, the Centocor R&D Postdoctoral Fellowship offers up-and-coming minority scientists the opportunity to work on campus with U-M Medical School faculty and with teams of Centocor researchers at the company's Pennsylvania headquarters. The projects, selected by a joint committee of Centocor and U-M representatives, focus on immune-mediated inflammatory disorders. In 2009, the committee approved a joint proposal by Juanita Merchant, M.D., Ph.D., H. Marvin Pollard Professor of Internal Medicine and Molecular and Integrative Physiology at the U-M, and Centocor R&D scientist Pamela Hornby, whose current research focuses on peptides involved in gut motility. A specialist in cell growth in the luminal intestinal tract, Dr. Merchant has also participated in programs aimed at recruiting under-represented minorities to careers as medical faculty and researchers. The ultimate goal of their proposed project was the development of a drug specifically targeted for functional bowel syndrome. The first fellowship was awarded to immunologist Angel Varela-Rohena, Ph.D., a native of Puerto Rico. 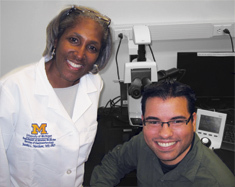 Varela-Rohena developed several assays at the University of Michigan under Dr. Merchant's tuteledge for a peptide target of interest to Hornby and her Centorcor research team. As Merchant notes, "It was an excellent marriage of skills. In addition to supporting our research efforts, Dr. Varela-Rohena widened our scientific perspective with his broad knowledge of basic immunology. In my judgment, this fellowship is a brave and forward-thinking commitment on the part of Centocor, one that will help achieve greater diversity in the medical research community." To date, a second fellowship has been awarded, and five promising new candidates are under consideration for the coming year. Moreover, there are plans to expand the program to include oncology-focused research proposals in the future. A new joint initiative by Centocor Research & Development, Inc. and the University of Michigan serves as an innovative model for industry-academic fellowship programs. Citing scientific excellence and diversity as key drivers in the company’s success as a global pharmaceutical organization, Dr. Miguel Barbosa, vice president, head, immunology research & external innovation at Centocor R&D, notes that the fellowship was designed “to foster the training of the next generation of scientific leaders by forging strong relationships with African American, Hispanic, and Native American researchers.” Pictured are Dr. Juanita Merchant and Dr. Angel Varela-Rohena.